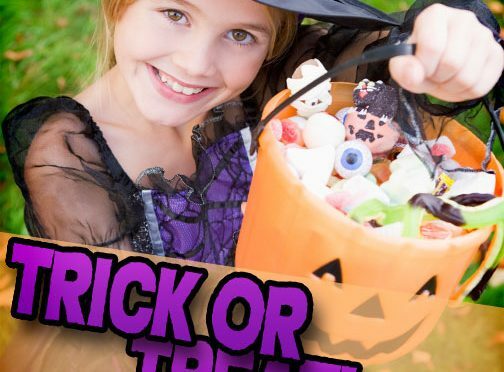 All year, kids look forward to Halloween night when they can dress up as their favorite characters and go out for a fun night of trick or treating. Follow these trick or treating safety tips to make sure everyone has a great Halloween this year! In all the excitement of Halloween night, it can be easy to forget basic safety precautions while on foot. Make sure kids remember to look both ways before crossing the street and only cross at designated spots. Also, put electronic devices away so everyone can focus on what’s going on around them. Whether you’ll be out with the kids this year or they’ll be out on their own, there is safety in numbers. If your kids are mature enough to be out without adult supervision, have them group up with trusted friends and stick to neighborhoods close to home. Integrate reflective materials and bright colors into a costume for something as fun as it is safe. Dark colors might seem appropriate but they make children hard to spot in the dark. Additionally, use bright face paint instead of masks to keep your child’s eyes and mouth unobstructed. If you’ll be out on Halloween night, keep in mind that children will be all over and be moving around unpredictably. Keep your eyes on the road and drive slowly even after designated trick or treating times. For a vehicle that offers unbeatable safety and performance, stop by Wantagh Mazda today. But remember, while Mazda’s advanced safety features do a lot of the work for you, nothing replaces safe and responsible driving on your part.